bat – jen wewers, m.div. In November, I was speaking with someone in my office and noticed this furry thing hanging on the wall outside my window. It actually took me a few minutes to realize I was looking at a small bat. Well, that surely is a sign. There are two levels to this one though. One simple, one more complex. First, the simpler. I had invited my office mates to come take a gander at the battiness that had decided to perch outside. One of those colleagues stayed to chat with me awhile. Since I am forever the extroverted thinker, my steam of conscious conversation led me to the children’s book, Stellaluna, by Janell Cannon. In this sweet children’s story a baby bat is separated from her mother and proceeds to be raised by a family of birds. The story ultimately is about diversity and being accepted for who you are, but at its heart is the story of a little girl bat who was separated from her mother. So I looked again at this little bat hanging out my window and resonated with the sense of being out of place, of separation, of loneliness. Now on day two I arrived to my office and the bat was still there. Here I begin to wrestle with the meaning of a dead bat, worrying that I might need to call the building manager to dispose of my little sign. Not where I wanted to go. But it really was not my choice. So at lunch I thought it might be time to delve deeper and searched for symbolism related to the bat. I imagined lots of negative associations – after all…Dracula! Vampire bats! Rabies! What good could come of the bat, you ask? But bat symbolism is rich, especially from the Native American traditions that celebrate the inherent worth of all life and our fundamental interconnectedness. Native American legends associate the bat with death because it flies at night and as a sign of rebirth because they always sleep with their heads down. The face down act is associated to the position of the baby before birth. In the society of Shamans, the bat represents the desire to die a ritual death before one is able to develop into a new being. It is therefore an animal which represented initiations. Where are my dreams and intuition leading me? Is there some place in life where I need to “dive into the truth” ? What is seeking to be reborn in me? What needs to die, in order that I may fully live? 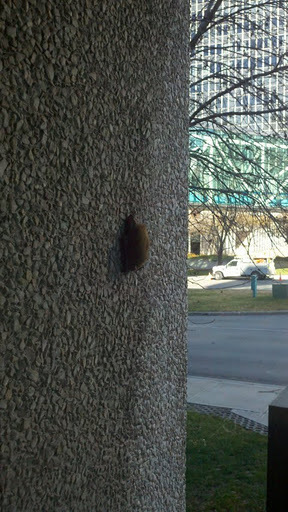 Although this bat sighting happened in November, I had little time to ponder my answers to the questions above, but I did start asking the questions. We often get hung up in trying to arrive at certainty (hah! ), conclusions, answers. I think it is more important to spend time articulating the questions. The answers will come, but asking the right questions is the first step. On the third day, I came to work, afraid that if my bat was hanging in the same place, I might need to make the call to the management company. I entered my office and walked to the windows. The pebble wall was empty. Sometime the previous night my little bat had flown away. And after visiting me, I was more consciously living into answers to questions she had helped me to ask.